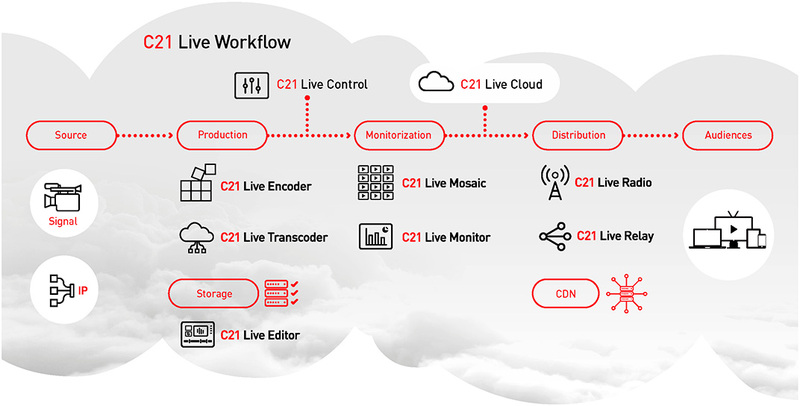 C21 Live Cloud is a Cloud Computing service which gives users the opportunity to access any of the Cires21 video streaming portfolio components anytime, anywhere. C21 Live Cloud not only allows the provisioning in the cloud of the virtualized Cires21 products, but also it adapts to any business model thanks to its integration with on-site platforms made up by appliances or software, and adapting to the specific needs of encoding. he easy escalability of any Cires21 product and the payment options offered, Pay-Per-Use or flat rate, enable new experiences in the multi-device streaming world. Real-time management via web or C21 Live Control. Allowing an intuitive management for both full cloud and hybrid solutions. Dynamic allocation of resources. The products of C21 Live Cloud are completely flexible in terms of their power to adapt to any need. On top of that, its quick deployment and adaptability allow its integration in any environment. Security. The security layer together with the physical environment of the datacenter help maintain an optimal level of protection for the audiovisual contents. High Availability. Ensures the redundancy of all components, most of the time through automatic, unattended procedures. 24 x 7 continuous operation and support. or Premium support service to adapt to any live event. Maximizes the audience. C21 Live Cloud allows the encoding, recording, editing, decoding and monitoring of its audiovisual content so it can be displayed on any device with the best quality. The continuos development of the C21 Live Cloud platform ensures that its content is available in any future format. Facilitates the distribution of new content. The possibilities of use of a hybrid platform (appliances or software and virtualized products in the C21 Live Cloud) makes the encoding options more flexible. Moreover using C21 Live Control reduces the learning curve of operating a dynamic encoding platform and the need for continuos training. Reduces the operating and deployment efforts. Its anytime, anywhere availability, together with the possibility of content ingestion from Cires21's software, significantly reduces the costs of logistics, launch and operation of any event. Optimizes investment and costs. The ease of adapting to the customer's environment according to their needs in every moment and the ability to manage and integrate any element ensures the streaming platform capacity to adapt, in addition to reducing the investment risk and optimizing the relationship between CAPEX and OPEX.